Annual symposium on combating anti-Semitism held days after anti-Semitic attack on synagogue in Pennsylvania which left 11 dead. The annual symposium on countering anti-Semitism took place last week in New York under the shadow of the shooting at a Pittsburgh synagogue less than two weeks ago. The event was a joint effort between the World Zionist Organization and the American Zionist movement. Israel's General Consul to New York Dani Dayan, Vice-Chairman of the World Zionist Organization Yaakov Hagoel, President of the American Zionist Movement Richard Heideman, and Rabbi Joseph Potasnik of the NY Board of Rabbis, with 300 American Jewish leaders in attendance at the symposium. 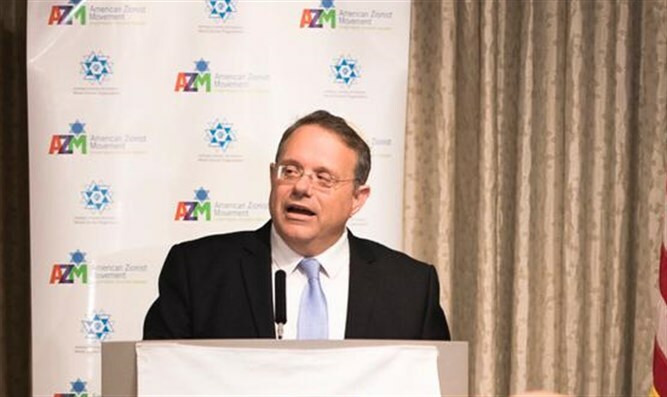 "Today we know that what starts with little attacks and does not stop... could eventually turn into a catastrophe, so we need to demand from our leaders and say ‘if you say never again - act now’,” Israel's Consul General in New York Dani Dayan said. "We shouldn’t forget that four years ago…an anti-Semite shot people at a local JCC, and killed three whose only sin, their only crime, was that they were suspected to be Jewish. We are one people, there is no difference between one Jew to another, between a Democrat and Republican and Reform, Conservative or Orthodox, between men, women and children, and between Ashkenazim and Sephardim. We are all one people, a special one and all of us are in this war together." American Zionist Movement President Richard Heideman said: "We must promote a policy of zero tolerance, we must be united with Israel in our hearts, put politics aside. This is a time for Jewish unity to be more important than ever, and this Judaism enables us to build a safer future for the Jewish people around the world. We will not be able to do this without this policy ... We will talk directly and take steps and break out and do so in a way that will respect everyone but also the right we have as Jews to live in peace."